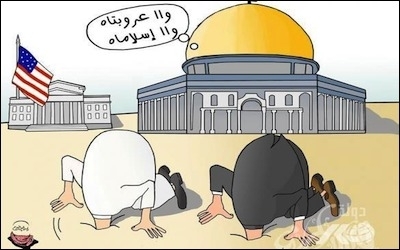 A cartoon posted on a website of Palestinian President Mahmoud Abbas's Fatah party depicts the Dome of the Rock calling out futilely to Arabs and Muslims for assistance as an American embassy pops up nearby. A lot happened in Washington this past week. But through the whirlwind came a huge development: President Trump is expected to recognize Jerusalem as the capital of Israel. It's a symbolic move for sure — the embassy will remain in Tel Aviv for the time being — but it sends a powerful message that makes achieving a lasting solution to the conflict far more likely. This past week, we commemorated the 70th anniversary of the plan passed by the United Nations to partition what was then a British Mandate territory into two states: a Jewish and Arab state. The Israelis, of course, accepted the plan. The Palestinians, then vassals of neighboring Arab kingdoms, rejected it and soon launched a war. That war was long and hard-fought, but Israel triumphed — at least, that's what the Israelis and the West thought. U.S. recognition of Jerusalem as the capital of Israel is step forward in achieving lasting peace. For the Palestinians, it seems, that war is still being fought. And that rejection continues. Years of concessions, of work to build the Palestinian Authority into something capable of handling the levers of power that a state must wield, have brought us no closer to peace. Shaming Israel politically for defending its own people hasn't worked either. During the Oslo Accords, the Palestinians recognized Israel as a state, but to this day they still haven't recognized Israel's right to exist as a national homeland for the Jewish people. It may seem like a minor detail, but it's critical to understanding the only true path to resolving the longstanding conflict. Same with another seemingly minor action: this year's Palestinian attempt to force the British government to apologize for the Balfour Declaration, the century-old document promising the Jewish people a homeland in what would become Israel. Viewed through the Palestinian lens, these are terribly important. Early this year, my colleague Daniel Pipes at the Middle East Forum set out to reframe the way we all think about the conflict between the Israelis and the Palestinians: What if it's not a capacity problem, or an economic problem, or even a territorial or ethno-religious problem? What if it's simply the case that a war cannot truly end without one side declaring victory and the other accepting defeat? Then this month, something remarkable happened. A group of legislators from Israel — the Knesset Israel Victory Caucus — came to Washington. They met with influential leaders in the American Jewish community. They met with some of the leading thinkers on these issues in the press and academia. Perhaps most significantly, they met with policymakers in the Trump administration and in a like-minded group in Congress, the Congressional Israel Victory Caucus. The Knesset and congressional groups pledged to work together toward reframing the paradigm through which we all view the conflict. They signed a statement that said, in part, "the primary obstacle to ending the Palestinian-Israeli conflict is the near-century of Palestinian rejectionism of the right of self-determination for the Jewish people." And that's the crux of the problem. How can Israel make peace when the Palestinians don't want peace? 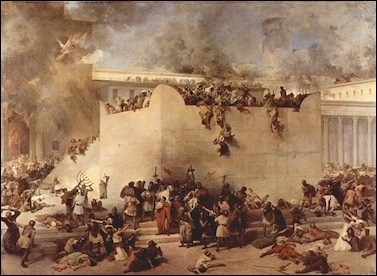 Destruction of the Temple of Jerusalem, Francesco Hayez, 1867. Jerusalem's Judaic history dates back thousands of years before the birth of Islam. That may sound incendiary, but think about it for a moment. Individual Palestinians surely want the conflict over. But as a nation — a people — they still seem convinced that they have the choice between accepting Israel and coexisting or rejecting Israel and eradicating it. It's a false choice, and the price for continuing the fantasy — to both sides — is simply too high. These caucuses will advocate for policy within their own governments aimed at reaching this shared goal. So what does that policy look like? The natural first place to start is to erect sanctions against the Palestinian Authority and Hamas as long as they continue their rejectionism. While the Israeli delegation was in the U.S., Congress took an important first step in this direction by moving the Taylor Force Act out of committee, and is expected to pass the full Congress this week. This bill is critical because it cuts off one of the key means by which the Palestinian leadership entrenches the conflict: paying money to the families of terrorists. Passing that bill into law would be a great start, but there's a lot more that must be done before the Palestinians finally accept reality. Another option is to undertake serious campaigns in the media to change the minds of the Palestinian people. Campaigns that work to drain the Palestinians' will to reject Israel will pay dividends in the medium- to long-term. Likewise, the around 20 percent of Palestinians who accept Israel as a Jewish state should be empowered to push their leadership in that direction. The United States and Israel can both take important steps to isolate the Palestinians. For too long, their failed leadership has been propped up by Arab allies who see perpetual conflict in Israel as a way to justify their own repression at home. Reports about Mahmoud Abbas's recent meeting in Saudi Arabia prove encouraging on this front, as they are beginning to demonstrate unprecedented pressure on the Palestinian leader to compromise. Trump's move on Jerusalem is about exactly what Palestinians fear: proclaiming that Israel wins. Finally, the United States should work closely with the Israeli government to find ways to provide diplomatic and political cover to more effectively defeat Palestinian terrorism, rather than pressuring Israel to hold back each time its people are attacked. Before her death nearly 40 years ago, Golda Meir, the left-wing prime minister of Israel, famously said, "peace will come when the Arabs will love their children more than they hate us." She was right. For peace to come, the Palestinians must decide that they have more to gain by giving up the conflict than by perpetuating it. Hopefully the Palestinians will understand that Trump's move on Jerusalem is about exactly what they fear: proclaiming that Israel wins. That's the only path forward.